Easy Archives | When "Fit" Hits the "Shan"
Are you perpetually running late? I was a very punctual person before I had kids. Remember those days? I knew exactly what was on my schedule for the day, I had an organized to do list, and everything that needed to get done did get done. There were just more hours in the day before my cute family got bigger. But I wouldn’t trade it for anything! I strongly encourage moms to dress up and look nice on a regular basis. It’s so great for our emotional well being, our self-confidence, and our sense of purpose! I love to feel like I look good, even if it’s just a day at home. But… If I can’t even get my kids to school on time in the morning how am I supposed to take the time to do my hair and makeup? Here’s some gorgeous mamas who know what to do! Comment below- What is your favorite quick hairdo? How do you do it?? This is my favorite how-to for a beautiful messy bun. So quick, so easy, and so classy! Not only does it save you time because it’s easy to do, but it saves you time because your hair doesn’t have to be clean! Perfect for those crazy mornings when you don’t have time to shower. 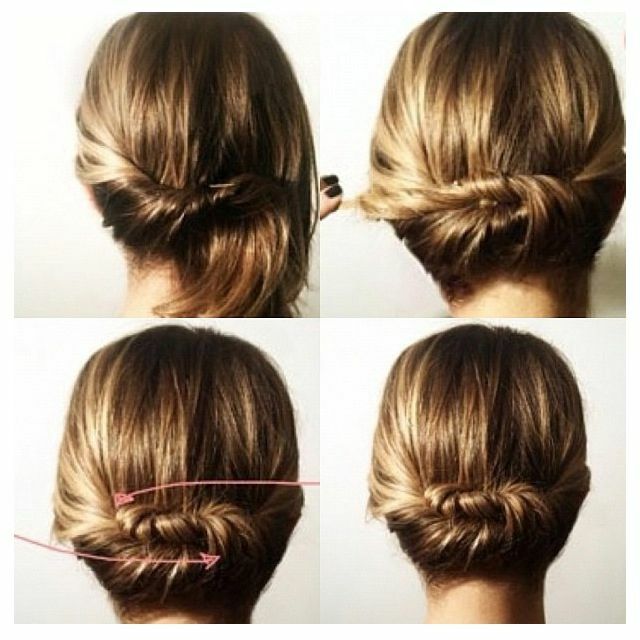 Here’s the simple steps to a perfect messy bun. -Flip your hair over your head. -Gather hair into a high pony tail. -Wrap the twisted hair around the pony tail into a thick bun. -If desired, pull hair in different directions to make the bun messier. That’s it!! Done and done! Grab your kid’s backpack and be on your way! This style looks so cute and fresh, but it only takes 5 minutes to complete! -Separate hair into two strands in the back of the head. -Tie the two strands together twice into a double knot. -Secure the bottom of the knot with a pony tail. -Tuck the pony tail under and around the knot. Look at this amazing twist on a boring pony tail!! This is so clever and unique, and it can be done in the same amount of time it takes your six-year-old to eat a bowl of cereal on the way to school. That’s right, you could be done with your hair by the time your kid is done eating in the morning. -Separate your hair into two strands off to the side of your head. -Tie the two strands into a knot twice to create a double knot. -Spread out the hair in the lower sections of the knot to cover the pony tail. You’re done! Hurry off to work! Want something creative? Something new? Something unique? Try the literal hair bow. As in, your hair is the bow. So cool! -Separate one thin strand of hair on the right side of your head and one thin strand of hair on the left side of your head. -Pull both strands of hair to the back of your head. -Tie the strands of hair together into a bow- just like you were tying your shoe. -Secure the bow with bobby pins. So easy! And so adorable! You’ll be the coolest mom at the PTO meeting! This is a beautiful look, but it takes no effort at all! You can be done in time to grab a cup of coffee before you have to run out the door! -Choose what size of a section you want to twist. Pin the rest of your hair back so it is out of the way. -Out of the chosen section, begin at the top of the head. Section out two small strands. -Twist the front strand over the back strand of hair. -Section out another small strand of hair. -Twist the next section into the existing twist. -Slowly section out additional small strands and add them to the twist one at a time, until you have twisted the whole section. -Secure with a bobby pin. Do you ever wish you had bangs, but are you too scared to take the plunge? Try bangs for a day, enjoy the fresh new look, but you don’t have to stick with it if you don’t want to. And you’re done with plenty of time to drive your kiddos to school. That’s the best deal I’ve heard all year! -Use a small section of hair from the pony tail. Bring it forward. Fan the hair so that it falls across your eyes and forehead to make fake bangs. Use bobby pins to secure your fake bangs in place- adjusting for the appropriate length of bangs. -Twist and wind the remaining hair in the ponytail into a thick bun. This will hide the origins of your fake bangs, keeping everyone wondering where your gorgeous new look came from! Viola! A beautiful new look! Love it or leave it- no harm done! And you’re on time to your first appointment of the day. This is genius! It’s so fancy, and yet you can be done in TWO MINUTES! It’s even in the name! And this is another great hairdo if you don’t have the time to shower in the morning. No problem! This sweet style is so simple. Try it today! -Part your hair in the middle or off to the side. Use a cute elastic headband- placed with the front of the headband on your forehead. -Take thick sections of hair around the back of your neck, leaving out just a little hair to frame your face. -Tuck the strands of hair into the headband. Loop the hiar up and under the headband. You’re done! Time to get on with your busy day… and with a look like that, it’s sure to be a great day! This hairdo looks like it took all day but it’s actually only a few seconds! I could get this done before my child finds her shoes! And it looks so classy! Absolutely beautiful. This hairdo works best with short to medium length hair. -Separate hair into two strands. -Twist the first strand and pin it to the opposite side. -Twist the second strand. Loop it over the first strand and pin to the opposite side. Beautiful, quick, easy. It’s perfect for a school day morning rush. Another gorgeous bun, just as simple to create and soooo cute. This looks so professional, but it doesn’t take all morning to look like this. -Pull your hair into a low pony tail in the back of your head. -Wrap the braided pony tail around itself. You’re ready to go! Lookin’ hot! I love this look. Gorgeous and classy, but not time consuming. Your hair is out of your eyes and face. You look stunning, but not too fancy to run errands. You’ll be looking perfect before your kids even start arguing this morning! That’s right, and for my kids that’s about the first 10 minutes of being awake. And again, no clean hair necessary so this is a great solution if you just need a few extra minutes to push snooze. -Separate one small strand of hair on the right side of your head and one small strand of hair on the left side of your head. -Pull back the twisted strands of hair. -Secure with an elastic band. You can get your hair up while your kids are eating breakfast, while they’re searching for their lost backpack, or finishing that last homework assignment. You’ll look so wonderful with any of these tricks without any hassle. Share this post with all parents who need some extra time in the morning!